Transcription factor binding specificity and chromatin context work together to orchestrate cell differentiation. (a) Schematic nucleus showing only a few chromatids and a representation of NEUROD2 and MYOD binding sites. E-box motifs that are targets of transcription factors in the Myod and Neurod families exhibited three different patterns of factor binding in the study by Fong et al. (2012): MYOD-specific (pale blue), NEUROD2-specific (red) and shared (purple). (b) Chromatin context appears to be pre-determined by the cell lineage (open, accessible compartments shown in white; closed, inaccessible compartments in gray). A remaining question relates to how such chromatin contexts are determined in the first place, or are modified, by the different cell lineages. (c) Exogenous expression of NEUROD2 converts P19 cells into neurons, but fails to induce neurogenesis in MEF cells. Findings of Fong et al. (2012) suggest that developmental outcome is a consequence of the interplay between transcription factor binding patterns and the pre-set chromatin context. Photomicrographs at the bottom show empirical results, with neurons derived from differentiated P19 cells appearing on the left and undifferentiated fibroblasts on the right (nuclei in blue due to DAPI staining; neuron-specific class III beta-tubulin in green due to staining with Tuj1 antibody; colors merged in both photomicrographs). Photomicrographs courtesy of Dr. Abraham Fong. Image designed by Drs. Stephen Tapscott, Abraham Fong and Matt Arnegard. It may come as no surprise that the transcriptional programs associated with the development of neurons and skeletal muscle cells differ substantially. What remains puzzling, however, is that the differentiation of each of these cell types is regulated by very similar basic-helix-loop-helix transcription factors. The Neurod family of factors regulates the differentiation of cells that will eventually make up the nervous system, whereas the Myod family results in the differentiation of a very different kind of cell that builds skeletal muscle. Transcription factors in both families bind to target sequences containing six core nucleotides: CANNTG. This sequence is referred to as an E box. Each N’ stands for any one of four nucleotides, reflecting the scope that exists for specific (or shared) transcription factor targets. Until now, the actual degree of shared vs. specific binding between the Neurod and Myod families has not been quantified in relation to the developmental programs they regulate. In an earlier study, Dr. Yi Cao, principal investigator Dr. Stephen Tapscott (Human Biology Division) and co-authors used chromatin immunoprecipitation and high-throughput sequencing (i.e., ChIP-seq) to identify genomic targets of MYOD binding in mouse muscle cells and mouse embryonic fibroblasts (MEFs), which can be converted to muscle by transduction with MYOD. Cao et al. (2010) discovered tens of thousands of MYOD binding sites and determined that the preferred E-box for this canonical Myod family factor is CAG[C/G]TG. The authors also showed that MYOD binding was associated with regional histone 4 acetylation. This type of epigenetic modification helps transform chromatin from a form that is closed’ to one that is more open’ or accessible to transcription factors and, therefore, conducive to gene transcription. 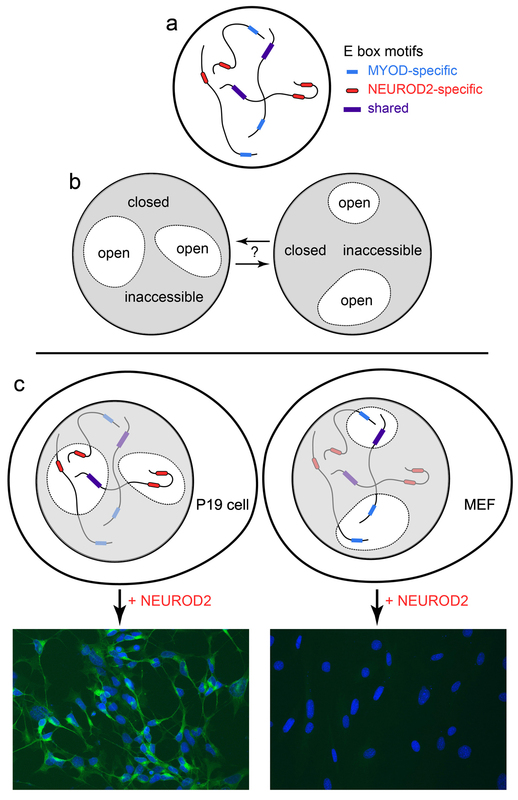 It was also known that NEUROD2 fails to induce neurogenesis in MEFs, though NEUROD2 readily converts pluripotent P19 cells into neurons (see figure). These previous findings inspired Dr. Abraham Fong, also of the Tapscott Lab, to set out with largely the same team of researchers to compare the genome-wide binding sites and transcription profiles of NEUROD2-mediated neurogenesis to those of MYOD-mediated myogenesis. Their goal was to crack the conundrum of how such similar transcription factors orchestrate such different developmental outcomes. Fong et al. (2012) found both shared and private E-box motifs for NEUROD2 and MYOD. They demonstrated that both transcription factors bind the shared target sequence, CAGCTG. At the same time, NEUROD2 specifically binds CAGATG, while MYOD binds its private target, CAGGTG. Fong and co-authors further showed that binding at the NEUROD2-specific motif is associated most strongly with gene transcription for the neuronal differentiation program, and that binding at the MYOD-specific motif tends to be associated with transcription of the muscle differentiation program. In contrast, binding at shared sites is more strongly associated with regional chromatin modifications than with gene transcription. Tapscott’s team made an additional finding of importance: In MEFs and P19 cells alike, transcription factor binding is largely constrained to E-boxes that were previously organized into accessible chromatin domains. This important pre-setting of the chromatin context appears to be specified by each cell lineage (see figure), whereas the cell differentiation program is genetically encoded by the location of factor-specific E-boxes throughout the genome. These intriguing findings raise a key question that the researchers plan to pursue next: How does each cell lineage establish the specific chromatin context necessary for proper differentiation? Fong AP, Yao Z, Zhong JW, Cao Y, Ruzzo WL, Gentleman RC, Tapscott SJ. 2012. Genetic and epigenetic determinants of neurogenesis and myogenesis. Developmental Cell 22:721-735. Also see: Cao Y, Yao Z, Sarkar D, Lawrence M, Sanchez GJ, Parker MH, MacQuarrie KL, Davison J, Morgan MT, Ruzzo WL, Gentleman RC, Tapscott SJ. 2010. Genome-wide MyoD binding in skeletal muscle cells: a potential for broad cellular reprogramming. Developmental Cell 18:662-674.